They’ll thank you a bunch for this brunch! 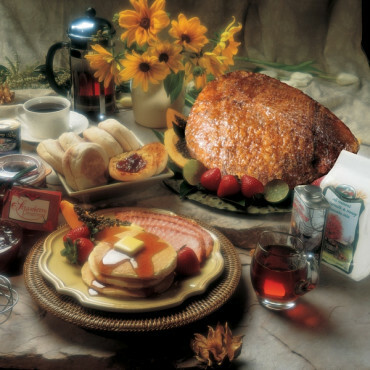 Our Ranch House Brunch includes: our incredible 13 Lb. HoneyBaked Whole Ham; Hickory Smoked Thick Sliced Bacon; our Buttermilk Pancake Mix; rich Maple Syrup; English Muffins; can of freshly ground coffee; and a jar of Gourmet Strawberry Preserves.